Three rings for the Elven-kings under the sky, Seven for the Dwarf-Lords in their halls of stone, Nine for Mortal Men doomed to die, One for the Dark Lord on his dark throne, In the Land of Mordor where the Shadows lie. One Ring to rule them all, One Ring to find them, One Ring to bring them all and in the darkness bind them/In the land of Mordor where the Shadows lie. And so begins what purports to be the definitive computer version of The Lord of the Rings by J.R.R. Tolkien, entitled War in Middle Earth, approved by the Tolkien estate itself! 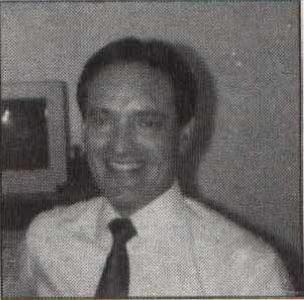 Actually, though, the computer game could hardly be expected to encompass all three stories of the trilogy, and the player finds himself somewhere between the first and last episodes. The main character, Frodo Baggins, has just inherited a ring from his Uncle Bilbo Baggins' estate. The ring, according to the wizard Gandalf the Grey, is the One Ring. It was forged by Sauron the Dark Lord and is both powerful and evil. It contains much of Sauron's power, and if Sauron were to obtain it, he would defeat all of his enemies and subjugate the whole of Middle Earth. If Frodo (the ringbearer) were to attempt to use the One Ring against Sauron, he would be corrupted, actually becoming a Dark Lord himself. Therefore, the quest is to destroy the One Ring. This can only be accomplished by tossing it into the Cracks of Doom (the volcano, Mt. Doom), where it was originally forged. Mt. Doom is in the center of Sauron's kingdom of Mordor, far to the southeast. Along the way, armies of orcs, nazguls, dunlendings and wizards will attempt to wrest the One Ring away from the ringbearer. If this should happen, all is not lost, for the ring can be retrieved and the quest continued. However, the ultimate goal is best pursued by attempting to gather an army of friendly warriors to defend the ringbearer so that the One Ring can be protected. War in Middle Earth is not just a fantasy role-playing adventure, but also a war strategy game in which the player must deploy the forces of good against bad to stem the tide of evil and facilitate performance of the quest. As far as role-playing goes, the player takes on the role of not one character, but many! He may leave his role of ringbearer to take on the role of Gandalf the Wizard or King Aaragorn, as well as powerful generals, such as Theoden, Lord of the Mark and Faramir, leader of the Rangers of Ithilien. As a war strategy game goes, when a clash with an unfriendly army occurs, the player must decide whether members of his merry gang will engage, attack, withdraw or retreat. Not only can he do this for individual members of his troop, but also squads of friendly soldiers who have joined the holy crusade. 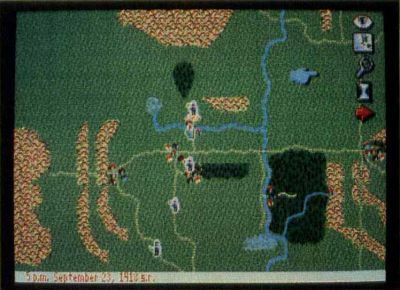 The game is played on a 36-screen map that scrolls in any direction. The scrolling is smooth and fast, something I can't say about the animation. After leaving the map, moving to the animation level reveals a small area of the map in which the characters can walk. Because of the lack of tastefully selected colors and clarity, this animation is substandard. 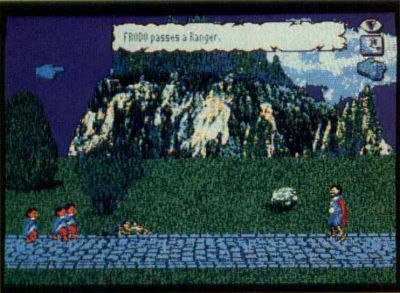 The backgrounds look more like they were hand drawn by talented children on an 8-bit computer than actual digitizations (as claimed in the manual) from real life. War in Middle Earth contains much in the way of pictures and maps, actually requiring three single-sided disks to hold everything. While this is a plus for multiple-drive owners, it's a hassle for the single-drive owner. It seems that just about every move requires a disk swap. For the two-drive owner, both drives can be used with little swapping, other than for the game-save function, which saves a single game to Disk One. Let's look at some of the game's high points. First of all, War in Middle Earth is fantasy-rich! I can't imagine anyone who enjoys fantasy not being absolutely enthralled with the world of Tolkien as interpreted in this game. Not being a fan of The Hobbit or The Lord of the Rings, my collaborator has made me aware that the plot line of War in Middle Earth seems very Tolkienesque. The campaign level represents a portion of Middle Earth approximately 250 miles by 150 miles. This is the 36-screen map, which can be multi-scrolled. Selecting this level's magnifying glass allows the player to enlarge a small area, at which time the program loads-in a background representing the area and animations of any characters that may be wandering through, thus moving up to the "animation" level. At this level, selecting the "eye" icon allows the player to gaze into the Mirror of Galadriel and see the status of characters on-screen. The "provisions" icon facilitates taking/dropping/using objects, and the "map" icon allows the player to move down to the campaign level. All in all, it's a simple and intuitive interface. Last but not least, the game's excellent 46-page instruction manual is not only complete when it comes to explaining game play and the player's ultimate goal, but also provides much historical background for the uninitiated player. If the potential buyer can look beyond the somewhat chintzy graphics, War in Middle Earth is a fantasy-lover's ultimate contest—one that he will come back to again and again.